Hello everyone! This is Becky from Patchwork Posse here to share a Halloween Project today. I blog about lots of easy sewing projects, and I’m the home of the 52 Quilt Block Pick Up and the Yearly Round Robin. Bats are an easy way to decorate for Halloween. Why not learn a little bit of hand sewing while you’re at it! They can be hung on a string or ribbon like a banner, out of trees, tossed through the air, on the front door hanging out as decoration or whatever you might have in mind. Grab some crazy colors with a matching fabric and you are ready for some Halloween bat fun! You can find the Halloween Bat here. Join me on Pinterest, Facebook, and at my blog! 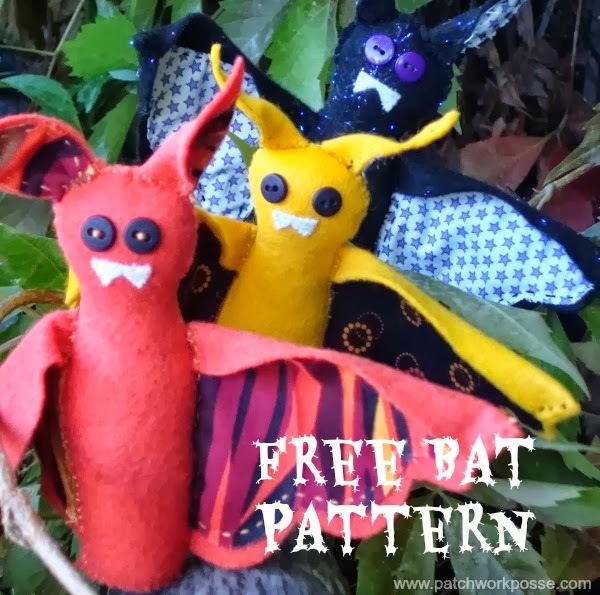 Aren’t these felt bats just adorable? I love them. They would make a cute garland too. Adorable bats. Thanks for the patterns.